“I have to say”, says Director Michael Powell prior to working on The Tales of Hoffmann, “I didn’t know much about the opera”. That makes both of us Mr Powell. 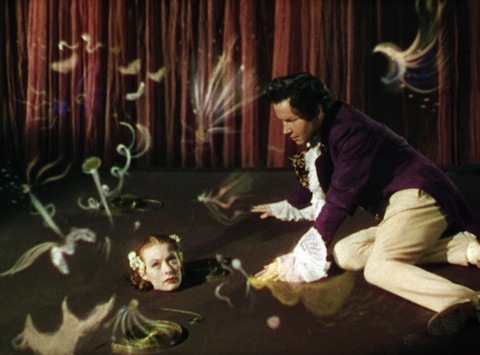 On Extended Run at the BFI this month is the Technicolor triptych-narrative, The Tales of Hoffmann. Released in 1951, this was made three years after Michael Powell and Emeric Pressburger’s celebrated masterpiece The Red Shoes. Rather than incorporating dance into a story, Powell and Pressburger decided to adapt a full performance in its entirety, presenting an epic story of romance, lost-love and tragedy. In the interval of a ballet, Hoffmann (Robert Rounseville) regales a crowd with talk of his previous exploits. Drunkenly holding court, he tells of his first romance with an automaton (Moira Shearer/Dorothy Bond), whereby he’s required to wear glasses to see her come to life. This seeps into the second Venetian story, a devilish tale whereby a dark-haired seductress (Ludmilla Tchérina/Margherita Grandi) manages to charm his attention and steal his reflection. 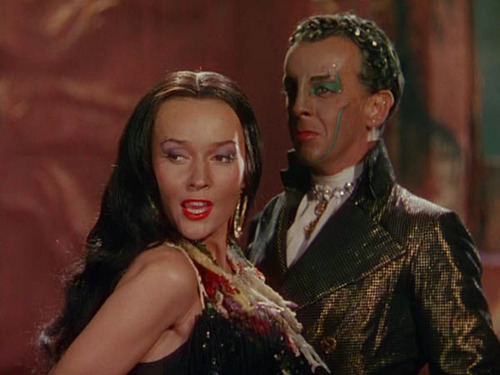 After a fight with her true lover (Robert Helpmann/Bruce Dargavel always playing the villain), he regains his mirrored-self but escapes, only to meander into his third story in Greece. 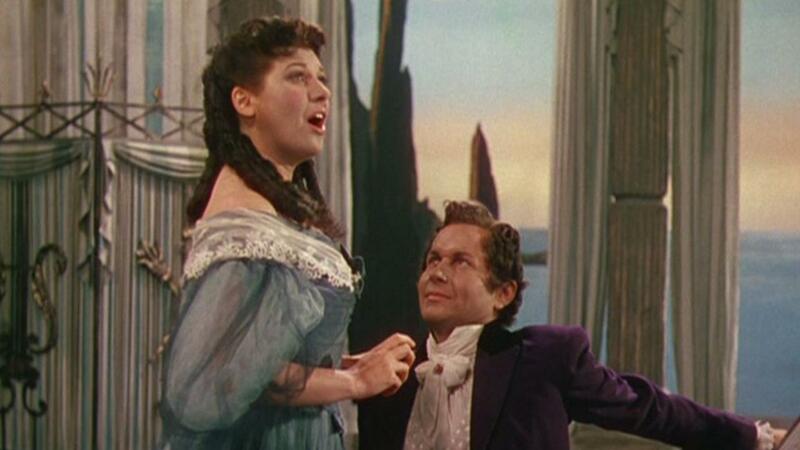 His final romance is with a dying singer (Ann Ayars). Her singing is what’s killing her, but her voice is what makes them happy. A corrupt doctor directs her voice and, inevitably, she dies. Returning to Hoffmann’s story-telling, we see his current love (also Moira Shearer) witness the drunken consequence, as he lays passed out on the table, so she leaves with his nemesis into the night. This recent restoration was by the Hollywood Foreign Press Association, with supervision by Martin Scorsese, the magnificent editor Thelma Schoonmaker Powell and Ned Price. Scorsese’s kudos will reach wide, and the influence of Powell and Pressburger’s grand filmmaking can be seen in many of his films, especially Shutter Island and Hugo. Glorious use of colour and dreamlike landscapes are simply mesmerising, carrying you away to a faraway land that we rarely see in cinema. The Red Shoes managed to capture that surrealist perspective that dominates the story in a single dance-sequence, while the magical opera-singing and out-of-this-world context in The Tales of Hoffmann only serves as a catalyst to exploit these dreamy notions further. Each story is unique and linked to a specific colour palette. The yellowed ‘Olympia’ story establishes Hoffmann as gullible and the sequence toys with his desperation for love. Each arrangement reveals different vices – and virtues – of Hoffmann. Moira Shearer is outstanding in her mechanical form, shuddering to a stop, before being wound up again. Hoffmann’s clown-friend, Nicklaus (Pamela Brown/Monica Sinclair) balances the seriousness, as her glances to camera expose her frustration, presented as ‘I-give-up-with-this-guy’ shrugs. When the palette shifts to the lustful, passionate red in Venice, mass orgies and occult-magic shift the tone, but the message seems similar: Hoffmann gives his love freely to Giulietta, at a high cost. Nicklaus again, stands idly at the side, resigned to observe foolish decisions. The final story holds the biggest heart, and the clown rarely interrupts. Antonia is good, and loving. The calmness of the blue resonate a sense of peace and hope in the story. Though, as the music builds, and the crescendo is loud, we know all will end in tears. This is not an easy watch, but it is unforgettable. Zombie-extraordinaire George A. Romero stated in 2002 that it was his favourite film of all-time – in fact, it is “the film that made him want to make movies”. Scorsese and Romero have seen something unique. Something so grand, and beautiful, that maybe only a directors-eye can truly appreciate. There is an argument that will defend the stage – why should we watch the film when the experience in the theatre will surely be superior. I’m not so sure. Powell’s ambitious direction, his vivid sets and extraordinary editing is innovative and breath-taking. One dance is shown from four different perspectives in the same shot. The dual characters are fun, but even more fascinating as one character takes off a mask to reveal himself again, and then another mask and a different character, played by the same actor. For 1951, this must’ve been terrific – and it remains terrific today.